Every IT service provider has to implement necessary changes, whilst protecting the services provided to customers. The need for sufficient control needs to be balanced with avoiding unnecessary bureaucracy. ITIL provides excellent guidance in this area. Change requests may originate as a formal Request for Change (RFC) document, or as a call to the Service Desk, or even as a project initiation document (PID). 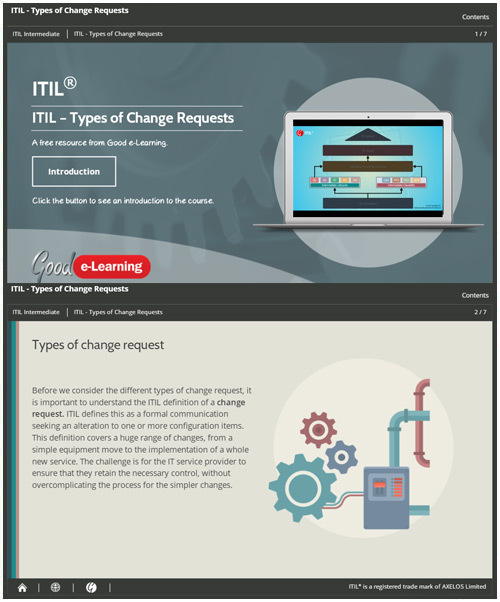 In this ITIL interactive guide we will look in detail at the different types of change request, and how each of these needs to be handled appropriately. Download this free ITIL interactive guide and you’ll also get instant access to over 500 business & IT learning resources!